Taking down the Christmas decorations can leave us feeling uninspired as we go back to work. We could all do with putting some sparkle in our lives in January… especially in commercial premises and the workplace. If your building looks a bit drab after the spectacle of Christmas, some refurbishment to the exterior could help give it a new lease of life for the new year. A splash of colour or a new look to freshen up the entrance can generate some energy and local buzz to make your business feel more welcoming again. Refurbishing your building’s cladding is not just a promise to lift the spirits of your customers and staff with some new and improved aesthetics. Your building itself can be a striking feature that enhances your corporate image by leaving a lasting impression on your visitors and that sets your business apart from competitors. A new look for your cladding or façade also offers the benefit of increasing the lifespan of your building. After all, any damage to your building’s cladding or façade can quickly deteriorate with weathering. Extreme weather, such as heavy rains and the cold frosts we get in winter, can corrode and compromise the protective external coating of your building. When cladding on your building becomes damaged, it is imperative that it is repaired at the first opportunity. A refurbishment gives you just this opportunity! At Buckingham Coatings we offer solutions for repairs and coating of all cladding, curtain walling, façade and roofing issues to help make your building look like brand new again. By maintaining you building’s exterior with regular upkeep and cleaning, our services are a cost-effective alternative to having to buy new, replacement panels. 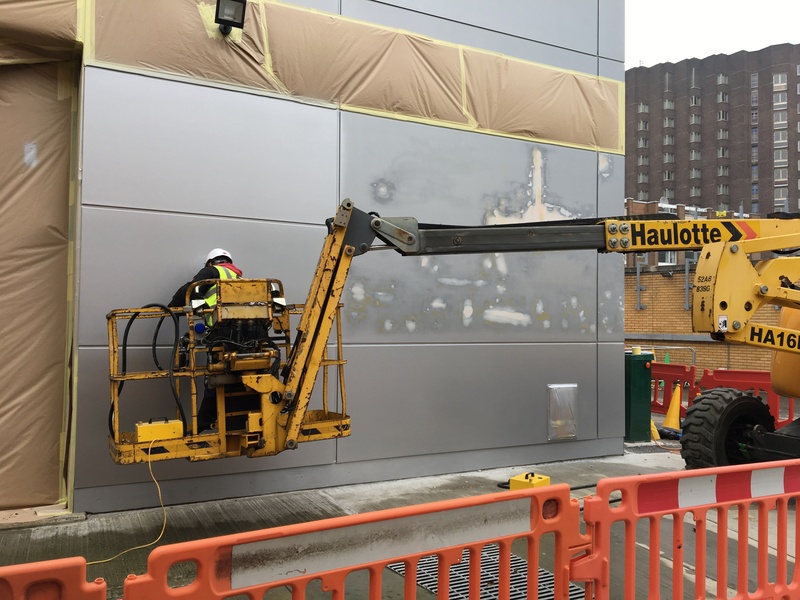 As specialists in repairing and recoating different types of cladding, from single skin, insulated, flat or profiled, we can meet your requirements – including panel repair to cladding manufactured by: Alucabond, Eurbond, Euroclad, Tata, Trespa and Kingspan. Our specialism in cladding refurbishment includes the provision of a new protective coating, a complete colour change and all remedial works to fix damage to your building’s exterior caused by rusting, peeling or chalking. Choosing Buckingham Coatings to refurbish the exterior of your building promises you a professional service and a high-quality finish.